Task Factory delivers SSIS components that make it simple to access data stored in cloud platforms. With Task Factory and its connectivity components, you're given the power to access data stored in cloud based platforms like Salesforce.com, Microsoft Dynamics, SharePoint, Twitter, Marketo, Facebook and virtually any REST-enabled application. All without writing a single line of code. 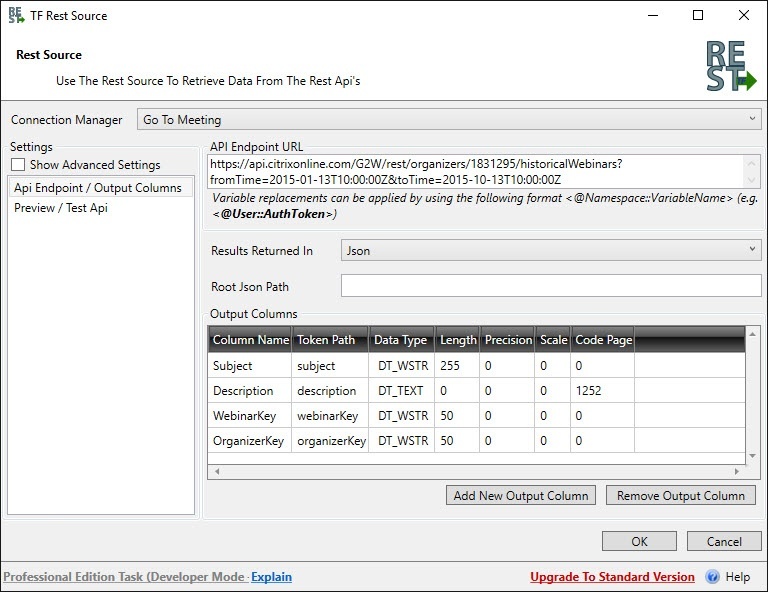 The REST Source in Task Factory allows you to connect to almost any web service / cloud application that utilizes a REST API and bring that data right into your data flow. The component can handle both XML and JSON data being returned from the REST endpoints which means it supports both legacy (XML based) and newly created (with JSON) REST endpoints. With its support for Basic REST, OAuth1 and OAuth2 authentication, using REST Source you can connect to and extract data from your accounts on platforms such as ZenDesk, GoToWebinar, Survey Monkey, MailChimp and many more! Before using the Azure ML Batch Execution Task, you can load source data from your local systems to be used during the execution of the Azure ML Prediction Web Service. The Azure ML Storage Destination is used to load data to the Azure blob storage file that will be used during the prediction service batch execution. You simply configure the Azure ML Destination to map your local source data to the Azure ML file that is expected during execution and go. The component takes care of creating the file and uploading it to the Azure blob storage for you. After executing the Azure ML Batch Task, there will be a resulting file written by the prediction / scoring web service that will contain the results of the prediction / scoring process. The Azure ML Storage Source is used to download this file and output it as source data that can be used in your data flow. This allows you to immediately get the results of a scoring process and continue to process the data based on your business rules. Each Azure ML Prediction / Scoring web service has an endpoint that can be used to kick off running a batch execution process. 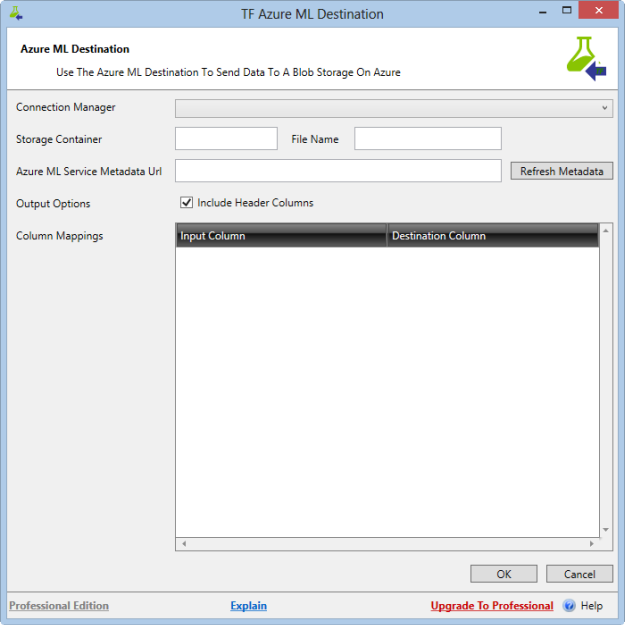 The Azure ML Batch Execution Task gives you the power to start the execution process right from SSIS. You no longer need to run this process manually. The Azure ML Batch Execution Task can be used with the Azure ML Storage Destination and Azure ML Storage Source to insert data before a batch execution and then retrieve the results of a batch execution. *Must have an Azure ML account to use this task. The three components in Task Factory for Azure ML all work in conjunction with each other. You don't have to use all three to execute an Azure ML / Prediction Web Service batch, but the Source and Destination give you the power to load data to Azure ML before a batch execution and retrieve data from Azure ML after a batch execution. When using all three components together you will be able to take data that needs to be scored by a prediction service, load it to an Azure ML blob storage location, execute an Azure ML prediction / scoring web service and retrieve the results immediately. The Marketo Source is used to retrieve data from your Marketo account. 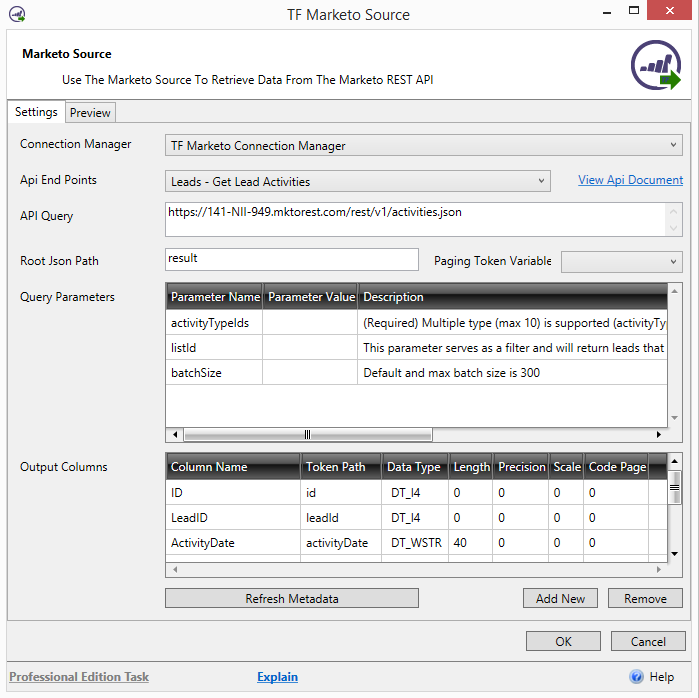 If you need to import data from Marketo for in-house processing, the Marketo Source allows you to retrieve any data supported by the Marketo Rest Api like leads, opportunities, and activities right into your SSIS data flow. The Marketo Destination is used to send data from your local environment to your Marketo account. If you need to insert, update, delete, or upsert data into the Lead and Opportunity objects from within SSIS, then the Marketo Destination makes it a snap. *See the Marketo Connection Manager page to learn more about setting up this component's connection manager. The Salesforce.com Source is used to quickly and easily retrieve data stored in your Salesforce.com account with a few simple clicks. 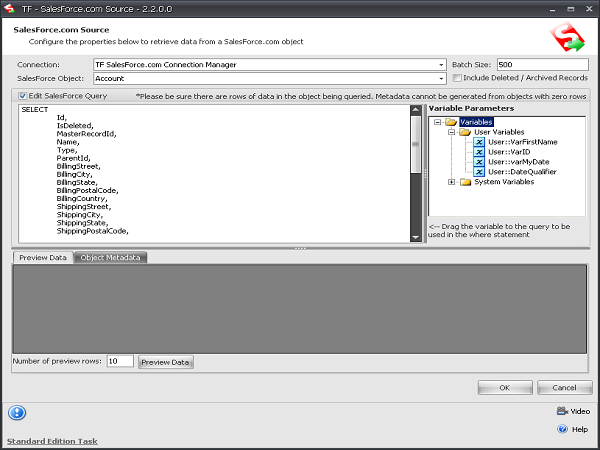 If you need to import data from Salesforce for in-house processing, the Salesforce.com Source allows you to retrieve any data supported by the Salesforce.com Soap API like leads, accounts, contacts and opportunities right into your SSIS data flow. Within 5 minutes, you’ll be pulling Salesforce data into your local environment. The Salesforce.com Destination is used to send data from your local environment to your Salesforce.com account. If you need to insert, update, delete, or upsert data into any Salesforce object from within SSIS, then the Salesforce.com Destination makes it super simple with very little configuration. Supports both regular and bulk mode transfer. *Must have an enterprise salesforce.com account to use this task. This is a salesforce.com requirement. *Task Factory now supports the TLS 1.2 encryption, as required by Salesforce. The Dynamics CRM Source is an SSIS source component that quickly and easily retrieves data stored in your Dynamics CRM system whether it’s on-premise or hosted online account with a few simple clicks. The intuitive interface includes advanced filtering capabilities, as well as a data preview pane so you know the data being retrieved from your Dynamics server is exactly what you need. 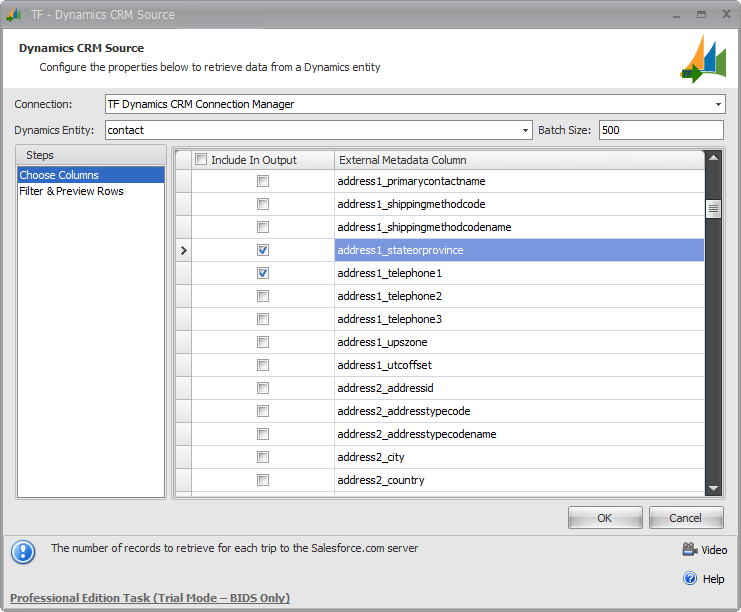 The Dynamics CRM Destination is an SSIS destination component that gives you complete control over the data stored in your Dynamics CRM server. The component allows you to insert, update, upsert and delete data stored in your Dynamics CRM Server. The user interface makes mapping your source data to the Dynamics entity quick and painless. You'll be controlling your Dynamics data within minutes. Supports Office 365, hosted and on-premise servers. 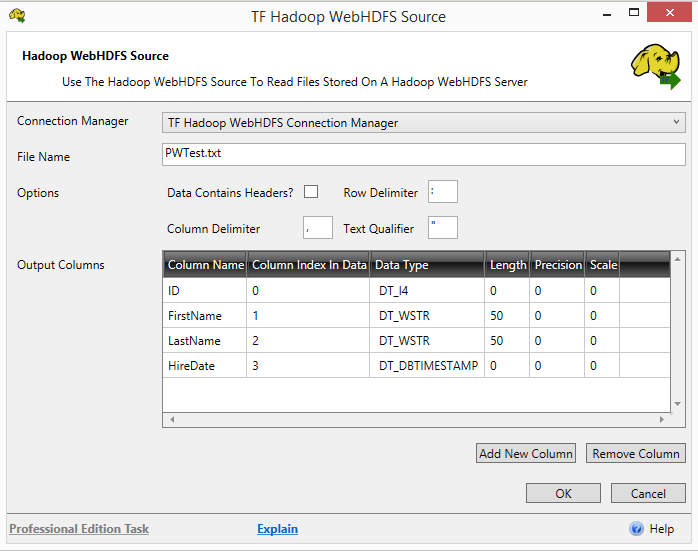 The Hadoop Web HDFS Source is an SSIS source component that gives you the ability to connect to a Hadoop Web HDFS instance and retrieve the contents of large text files. Data is easily parsed into columns in SSIS and streamed into the data flow, saving you more hours over downloading files, parsing them out and pushing them into your data flow. 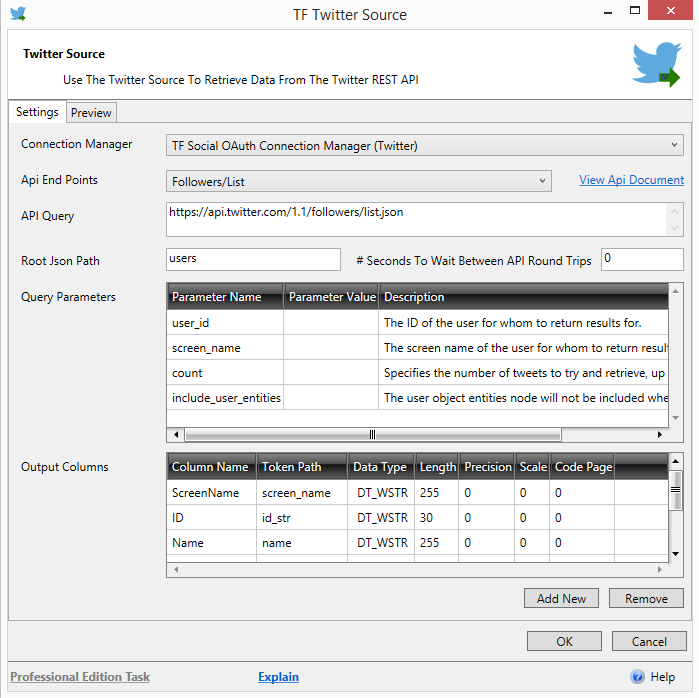 The Twitter Source is an SSIS source component that gives you the ability to connect to your Twitter account to retrieve information available from the Twitter Rest API Endpoints. These endpoints contain information like direct messages, timeline statuses, followers and your own list data, among others. The built-in Preview tab allows you to test various parameters and see right away if the data you want is being sent to you from Twitter. This reduces development time significantly because you aren't forced to run the package to see the data being retrieved. 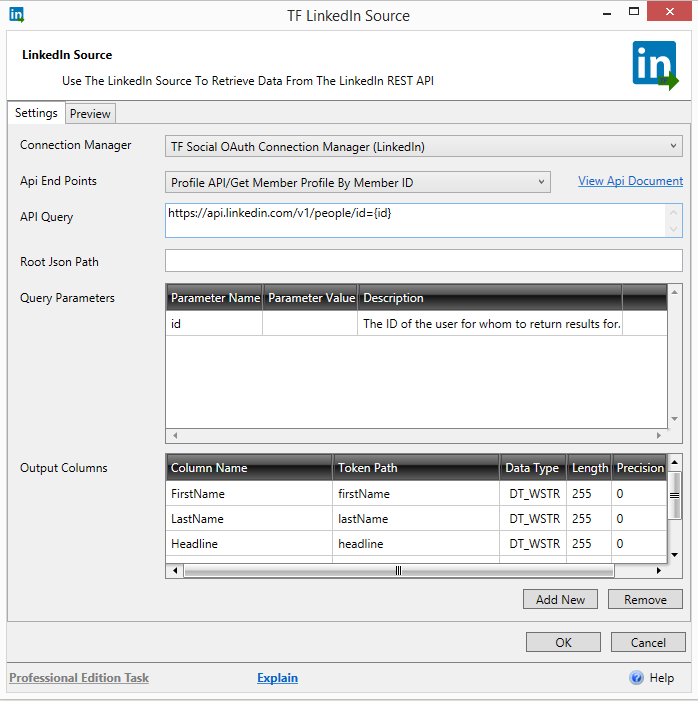 The LinkedIn Source is an SSIS source component that gives you the ability to connect to your LinkedIn account to retrieve information available from the LinkedIn Rest API Endpoints. These endpoints contain information like timeline posts, connections, profile data and much more. The built-in Preview tab allows you to test various parameters and see right away if the data you want is being sent to you from LinkedIn. This reduces development time significantly because you aren't forced to run the package to see the data being retrieved. 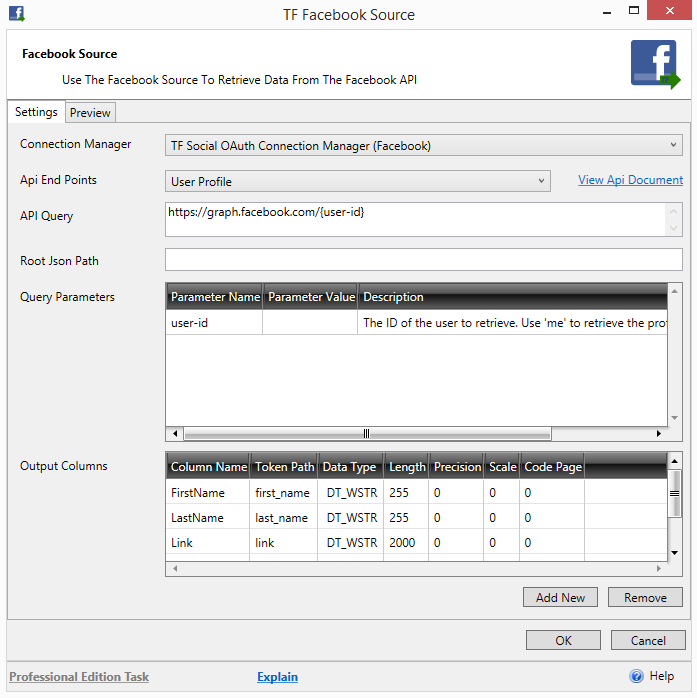 The Facebook Source is an SSIS source component that gives you the ability to connect to your Facebook account to retrieve data from the Facebook Graph Api Endpoints (including the Marketing Api). These endpoints give you access to information like status updates, friends, comments and inbox messages. The built-in Preview tab allows you to test various parameters and see right away if the data you want is being sent to you from Facebook. This reduces development time significantly because you aren't forced to run the package to see the data being retrieved.